The buttocks, or glutes, consist of three main muscles: gluteus minimus, gluteus medius and gluteus maximus. The gluteus maximus is the largest of the three and is the outermost muscle of the buttocks. It extends and rotates the hip and moves the leg toward and away from the midline of the body. The National Strength and Conditioning Association notes that several exercises can be used to build the gluteus maximus. The American College of Sports Medicine recommends strength training two to three days per week, in addition to regular cardiovascular exercise. Even if you focus on the buttocks, ideally you should incorporate movements that work all major muscle groups of the body. Individual exercises should be performed for one set of 8 to 12 repetitions. Although additional sets may lead to gains in strength, the difference is minimal; therefore, ACSM recommends one set. Exercises should be performed on nonconsecutive days and at an intensity level that causes your muscles to fatigue. Squats are a common exercise that primarily uses the gluteus maximus. They also engage the quadriceps and erector spinae. Squats can be performed with your body weight or by adding resistance in the form of dumbbells, barbells or resistance bands. According to the American Council on Exercise, technique is critical in this exercise. ACE recommends that you stand with your feet slightly wider than shoulder width apart, toes pointed slightly outward, and upper body and core erect. You then lower your hips and buttocks down and back behind you as if you are about to sit on a chair. Lower until your thighs are parallel to the ground and then, pushing up through the heels, return to the standing position. Forward lunges are another exercise that targets the buttocks, quadriceps and hamstrings. You can perform lunges with no resistance at first and then progress to using dumbbells. A lunge begins by standing erect with your feet together and then taking one leg and stepping forward. Place that lead foot flat on the floor in front of you and bend your knees to lower your hips straight to the ground until your knee joints are both at 90-degree angles. Return to the standing position by pushing back with the forward leg. You can either repeat the exercise on the same leg for a series of repetitions or alternate legs with each repetition. Other variations include reverse lunges, walking lunges and clock lunges, all of which engage the buttocks. A step-up is performed by using a 12- to 18-inch step. Just like squats and lunges, it can be performed with or without weights to build up the gluteus maximus. The NSCA recommends using a step high enough to create a 90-degree angle in the knee joint. The basic move is to place one foot onto the step and, using the muscles of that lead leg, lift the trailing leg up onto the step. The trailing leg is then used to lead you back down to the floor to the starting position. Once both feet are back on the floor, you alternate legs and repeat. A hip hinge, or good morning lift, is similar in movement to a bow. Using a lightweight barbell or weight bar to start, you place the weight across your upper back and shoulders and behind your neck. Hold your chest up and out and tilt your head slightly upward. Your feet should be slightly wider than shoulder width apart with your toes pointed slightly outward. From the erect position, keep your back and knees straight and bend at the hips. While bending, allow your buttocks to move straight back during the descent. The NSCA recommends bending forward until your upper body is parallel to the floor. Then return to the starting position and repeat. 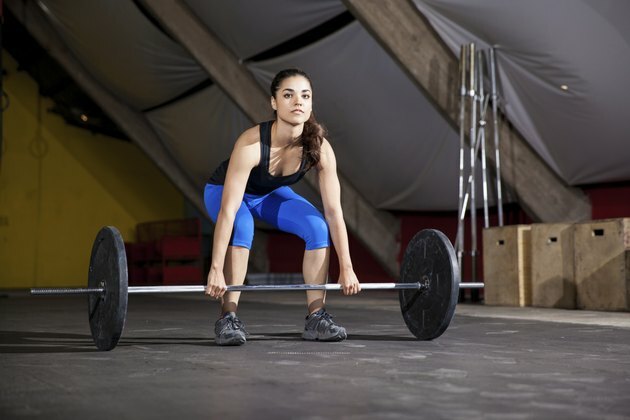 A deadlift is most often performed using a barbell or weight bar. It is when you begin with the weight on the floor, bend your hips and knees, and lift the weight off the floor. While lifting the weight, keep your back straight and rise with the weight by extending your hips and knees. The back remains flat throughout the entire exercise, and your elbows should be fully extended. To complete the exercise from the standing position, lower the weight to the ground again. There are numerous ways to vary all gluteus maximus exercises. You can incorporate resistance bands, dumbbells, barbells, weight bars, Bosu balls and medicine balls into your routine. Once you’ve mastered the moves and can no longer get your muscles to fatigue, then you can use some of these tools for progression. To ensure that your glutes are getting the focus during all exercises, professional bodybuilder Lee Hayward offers a few tips. He recommends squeezing your glutes as hard as you can when doing each exercise. His Total Fitness Bodybuilding website also suggests pushing with your heels during the exercise, visualizing sitting back and performing back-to-back exercises that engage the glutes.